A fort in the Indian town Agra, also known as the Red Fort (although there is another fort in Delhi which is also called “red”) is a fortress with a glorious history of almost five centuries long, a place designated not only for military leaders, but also for the great statesmen of the Great Mogul era, the majestic rulers who preferred to live in luxury and splendor that corresponded to their high position. 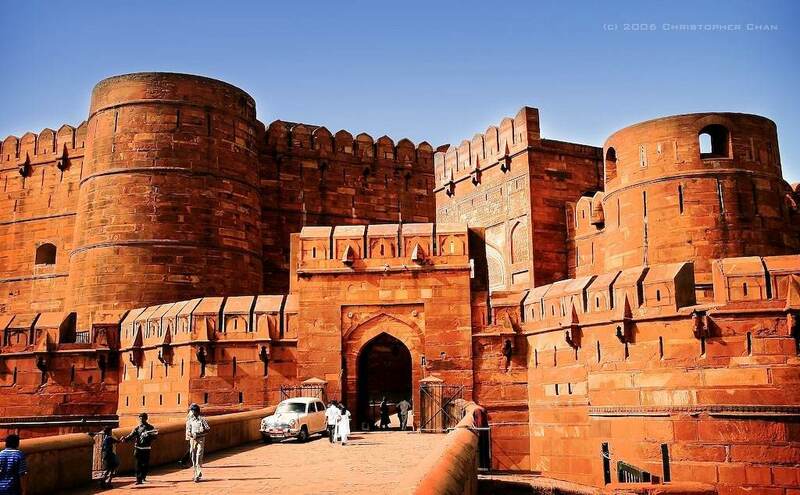 The construction of the fort was initiated by one of such great rulers, Akbar the Great, who decided to transfer the capital from the great Delhi to Agra, and in 1565 gave an order to start building at this site. It took several years to complete the fortress, and the wall around the fort appeared only in 1571. Agra Fort is situated within two and a half kilometers from the grand Taj-Mahal, on the bank of the picturesque Yamuna River. In the beginning of the 17th century it was significantly enlarged by the efforts of the followers of Akbar the Great, mainly by Shah Jahan. The ruler Akbar preferred red sandstone with addition of marble as the building material. The latter was used for the construction of the wall surrounding the fortress. Nevertheless, the architectural and artistic tastes of Shah Jahan were quite different. Among various types of the materials used, white marble decorated with golden ornaments and numerous jewels started to dominate. 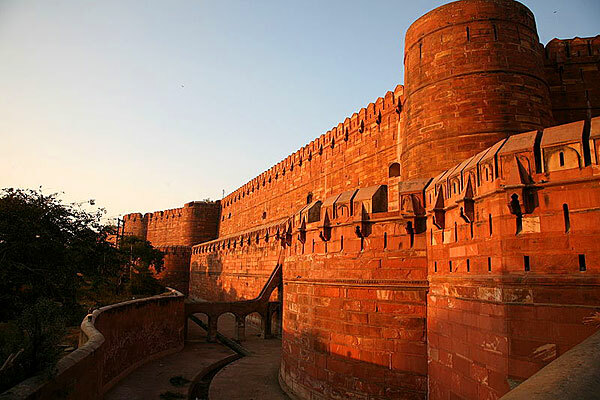 Agra Fort was a real jewel, not only in the artistic and aesthetic, but also in the literal sense of the word. Further destiny of the fortress was significantly influenced by the events of the unquiet Indian history. In 1648 the ancient Delhi again became the capital of India. Agra and its fort to a great extent lost their defensive and state-level importance. Ten years later, in 1658, the power was seized by the son of Shah Jahan Aurangzeb, who kept his father under home arrest until his death in 1666. 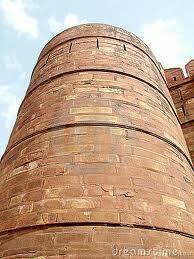 It was Agra Fort that was chosen as the place of his voluntary-compulsory imprisonment. In the beginning of the 19th century India became one of the English colonies, after being seized by the British invaders. Numerous historical and literary woks contain detailed descriptions of these events, which resulted in the Indian Rebellion of 1857 which was put down with a heavy hand by the British troops. Agra was seized, and the Fort became a place of bitter battles. Today the Red fort complex has the form of a half-moon in perspective. The height of the wall which surrounds it is 21 meters, and its total length is 2,4 kilometers. The entrance to the Red Fort is formed by two gates: The Lahore and Delhi ones. The architecture of the fort combines the features of the Hindu and Islam art of building. Unfortunately, time is relentless even to such great constructions, and today several parts of Agra Fort are destroyed. Just having a quick look at the thickness and shape of the walls one understands what a hard life the ancient rulers had. And the chronicles of that time also confirm that they had to beat off the attacks of various armies, and they did not always have success. Tall towers, narrow loopholes, a wide and deep ditch and the oozy riverbed, which served as a natural protection of a part of the fortress, – all these features show the carefulness and forethought with which this fortress was constructed. A rather big part of the Fort is inaccessible both for tourists and city dwellers, because it still performs some military functions. It is marked on the map as “Area under military occupation”. Along with the nearby Taj-Mahal, in 1983 the Red Fort was deservedly registered as a UNESCO World Heritage Site.